The Norwich Terrier is a working terrier, originally used to clear barns and stables of vermin all across the Norfolk broads. They became popular with the Cambridge students around the 1880's for the same reason and were given the name 'Trumpington Terriers'. The Norwich was recognised as a distinct breed from the Norfolk, distinguished mainly by its pointed, upright ears. The Norwich Terrier has a long and fascinating intellectual history, as his ancestors went to Cambridge University! Back in the 1870s, it was fashionable for Cambridge undergraduates to have rough terrier dogs, which came from a particular stable yard in Trumpington Street. These became known as Trumpington Terriers, and they earned a reputation as excellent college ratters. In 1900, one of these Trumpington Terriers, called Rags, was given to the owner of a stable yard in Norwich. He was so impressed with this dog that he used him to found a new breed, the Norwich Terrier. 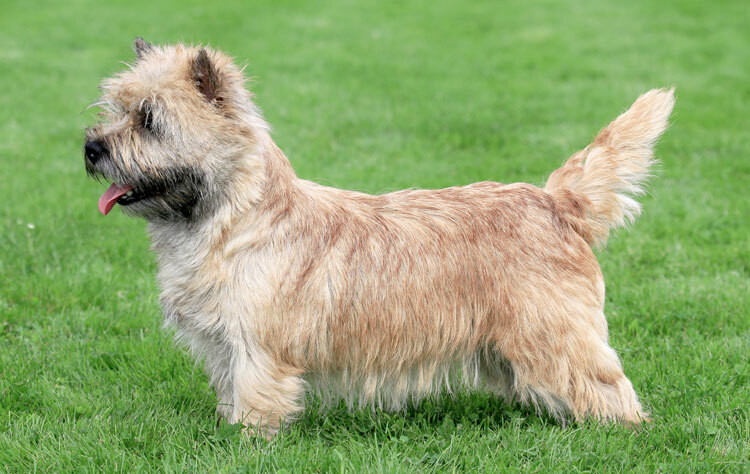 Despite being historically the same breed, the Norfolk Terrier, with his folded ears and softer look, has overtaken the original Norwich Terrier in popularity, and the Norwich is now a rare breed and included in the vulnerable native breeds list in the UK. There are many ways to remember which of the two has the folded ears and which has the prick ears: some say that Nor‘folks’ ears fold; others say that Nor‘wichs’ ears prick up like a witch’s hat! Alert and curious with a loving attitude toward their owner. They are an adaptable breed and will happily involve themselves in every aspect of your life with a cheery attitude. The Breed Standard describes them as having a "lovable disposition, not quarrelsome" making them ideal companions and excellent for children. The ideal height for the Norwich Terrier is around 25cm. They need regular interaction with their family and plenty of exercise to avoid lapsing into negative behaviour.